On any given weekend at my local airport I can count on there being a few different types of aircraft in the pattern during the day. One of the most recognizable is the Aeronca 7AC Champion with its yellow and orange trim. Most everyone refers to this classic as a "Champ", so I will too from here on out. One of the most significant advances in RC over the last 10 years or so has been the remarkable melding of RC and computer technology to create the flight simulators we enjoy today. Many components of the dazzling performances we see from top aerobatic pilots flying both airplanes and helicopters are first worked out on a flight sim, for the same reasons why flight simulators are great for rank beginners. You can fly whenever you have a moment to sit down at your computer with complete disregard for the weather and time of day. The near-instant, costfree recovery after crashing a virtual model allows you to take great risks as well, advancing your skills without the threat of countless hours or dollars spent repairing crash damage between flights. As I approach my 50th birthday and reflect on the 35-plus years I have been flying RC models, I have decided to make things a little easier for myself. Somewhere around my fifth year in the hobby, I acquired a field box. In it, I stored just about everything I needed to fly my glow-powered aircraft fuel, starter motor, 12V battery, tools, spare props, glow plugs, etc. It was not light, even for a young man! As I became more involved with electric flight but still flew glow models, things got more complicated. I had to take even more things to the field: chargers, flight batteries, etc. The field box got heavier; I actually had two! When I kicked the fossilfuel habit, things were easier for a time. Assuming that I always used my car battery as a source for my charger power at the field, the flight box was significantly lighter when I exclusively flew E-power. My relationship with helicopters has run hot and cold overthe years. Despite my lifelong passion for all things chopper,the choppers havenâ€™t always had a passion for me. Seewhether this sounds familiar: I was an ace on the simulator, and Ilogged countless hours flying indoors with toys and larger RC coaxialships, but the moment I ventured outside with a collective-pitchmachine, my thumbs and the laws of physics aligned against me. E-flite is well known in the electric aircraft arena for its many high-quality, great flying airplanes and helicopters. The Blade 400 3D follows that pattern. It is designed for intermediate and advanced pilots looking for a highly capable compact helicopter that they can fly almost anywhere. This is a high performance helicopter that can do more advanced maneuvers such as fast forward flight, loops, rolls, fly inverted as well as many gravity-defying 3D maneuvers. This awesome giant-scale F-86 was custom commissioned by Shailesh Patel, who hired master builder Joe Grice to build seven of these airframes. This Sabre weighs 52 pounds dry and has a length and wingspan of 96 inches (8 feet square). â€œIâ€™M BORED!â€ How many times does a parent get to hear those wonderful words? I know I must have heard them 1000 times or more this summer. 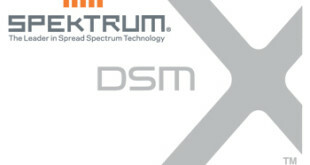 Horizon Hobby and Spektrum just released the new DSMX technology! 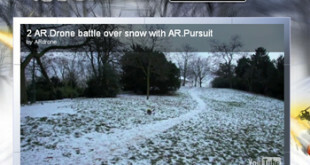 2 AR.Drone battle over snow with AR.Pursuit - this is one cool "toy" It seems as though there are new videos, mods and programs coming out every week!